Solar electric retrofitting businesses and homes offers powerful returns on investment and backup electricity in case of emergency. That’s the assertion of a distinguished group of energy experts who discussed solar energy return on investment on November 8th at the Provo Marriott. To a packed room, panelists charted the course for installing and financing solar systems for the quickest payback. Event sponsors educate d the public in advance of the January 2014 Utah Solar Incentive auction offering a limited number of large rebate incentives for small business. Door #1 – Do nothing: Rocky Mountain Power predicts power bills will DOUBLE over the next 10 years. 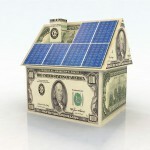 Door #2 – Go Solar: Eliminate your power bill with a solar system paid for in 10 years for $1 a day. Aspen Pines Apartments’ success in maxing out rebates that cover 95% of their system cost. Another featured panelist is Scott Cruze, a commercial property manager with a solar vision. Scott quantified how he is retrofitting more than a dozen client apartment properties with solar electric technology. Using current state and federal rebates and tax incentives, he is installing a single retrofit with $90k of equipment/labor for a net cost of under $5k per property. Both Dr. Stone’s and Mr. Cruze’s papers will soon be available at www.PPSWest.com . Solar ROI event sponsors include GOED, Utah Technology Magazine, Concept Property Management, City of Provo, Utah Valley Home Builders Association, Real Goods Solar, Platt Electric, and Progressive Power Solutions (www.ppswest.com).